The first country to legalize recreational marijuana is still going through growing pains in setting up its market. Uruguay, which legalized the drug nationally in 2013, is in no rush. The Latin American country wants to do it the right way, and that means, at least initially, a lot of restrictions. "They're very aware that they're the first in the world to do this," said John Walsh, director for drug policy and the Andes at the Washington Office on Latin America. "They've run with a tightly controlled model to show the world that they have control over the system." That heavy handed approach means only around 14 pharmacies in the entire country sell marijuana. Most of them are clustered around the capital, Montevideo. Many other pharmacies are weary of getting into the pot-selling business, primarily because of a major financial hurdle. Pharmacies across the country act as points of sale for pot that's been grown by just two state-licensed companies, Symbiosis and Iccorp. Buyers can purchase up to 40 grams per month. As of May, there were 24,324 registered buyers, according to IRCCA, the state department dedicated to the regulation and control of cannabis. But because Uruguay's economy runs on dollars, most pharmacies are routed through US banks. Those banks are forbidden by US law to serve accounts that "involve the manufacture, importation, sale, or distribution of a controlled substance." "The big US-based banks sent a memo to their Uruguayan counterparts, telling them they'd have to close their accounts if they proceeded," Walsh said. The existing pharmacies are left to resort to cash-only transactions, similar to the situation in US states like Colorado and Washington, which are managing legal marijuana industries of their own. It's also a deterrent for other pharmacies that might have otherwise jumped on board. "Had the obstacle not occurred, more pharmacies probably would've taken the plunge. Maybe dozens of others," he said. "There aren't nearly as many as was expected by this point." IRCCA is discussing how to overcome this hurdle, and Walsh said the most popular solution is to set up dispensaries separate from pharmacies. That'll mean more points of sale, and more even distribution. But when that happens, Walsh said, the supply could run short. Marijuana production has been erratic so far, because there are only two governmentally contracted suppliers. 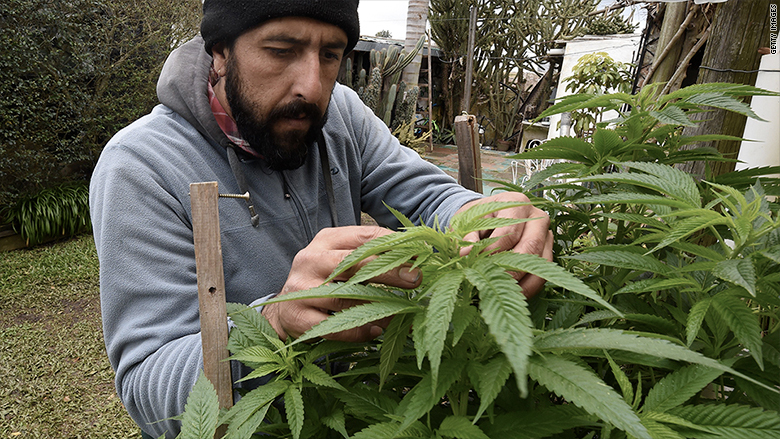 Uruguay is relatively inexperienced in marijuana farming, meaning some trial batches had to be rejected and recultivated. Residents are permitted to register as "homegrowers" or form "grow clubs" to cultivate up to 480 grams per person each year. But these homegrowers can't sell to pharmacies. But all things considered, the project is going well, said Hannah Hetzer, senior international policy manager at the Drug Policy Alliance. "It's too early to make any concrete evaluations," she said, "but the sky hasn't fallen." Regulated cannabis seems to have hindered the black market, which was one of the main aims of legalization. According to IRCCA's May figures, about 55% percent of marijuana users are partaking within the regulated system. "It takes a while for the illicit market to reduce," Hetzer said. The government controls the pricing of the product at pharmacies, and has priced it on a par with its rate on the black market -- at around $1.40 per gram. The low price discourages illegal competition because there's not much profit to be made, said Michael Komorn, a criminal defense lawyer and president of the Michigan Medical Marijuana Association. But the black market may still thrive with tourists. Uruguayan law forbids non-residents from purchasing marijuana. Still, the experts agree that the early signs are positive, even with the banking issue. That problem may even be solved by working with Canadian banks, an opportunity reinforced by Canada becoming the second country to legalize recreational pot in June this year. Along with Canada, Uruguay has taken the role of an international leader in this field, Komorn said. "It's going to be good for the country," he predicted. "It's the beginning of the spark of an economic renaissance."